Every day we cook, sleep, breathe, clean, and exist within our homes and offices. Each day we breathe in air, and unless there is a strange odor or direct effect on our physical health, people will not adjust the quality of their air. This becomes problematic as the air we breathe is not just important for generally staying alive, but it also affects our sleep, productivity, and of course health. Because it’s something we can’t see, it’s hard to really do more than turn an air purifier on, replace our air conditioning filters, and hope for the best. With Foobot (as well as a few competing solutions), people can now see what exactly they are breathing in, allowing us to adjust our environment. Foobot is a sensor packed Internet of Things device that tells you about your room’s temperature, humidity, pollution levels, and CO2 output. Through various sets of data, we can now see what we are breathing in. There are IoT and smart home hubs, and then there are devices that act like connected brains. For Foobot, it’s the latter. More than just data, due to Foobot’s various integrations it allows a smarthome to easily make the necessary adjustments to keep your air quality ideal for everyone. We tested the Foobot over two months to see how living with two dogs in the humid south can do to your air quality. There are few setup processes for gadgets that are what I would typically call memorable, but from start to running Foobot has a really fun and happy vibe about it. After unboxing the Foobot, simply plug it in, download the app, and follow the step-by-step prompts. From there it will ask you to connect to your WiFi, which has a goofy process of flipping it over, watching the onboard lights change, and then flipping it back over. From there, the app will prompt you to create your user account and it will begin collecting data. You also get to name your Foobot, and we have dubbed our test unit PotatoBot, which any future email alerts came directly from that name. Foobot’s core feature set focuses on telling you specifically how healthy your air quality is. To do this, it has at least two sensors (besides for humidity and temperature), and also estimates CO2 based on an algorithm using data from the volatile compounds sensor. Using data from BreezeoMeter, Foobot also shows what the localized outdoor air quality is as well. Unfortunately we do not have a sophisticated lab to break down just how accurate Foobot is, but we did run it through a gamut of tests to see what sensors would be triggered and by how much. After a hot shower, vacuuming or dusting, placing cold beverages near it, and coming in from a run, each time myriad readings would elevate or spike. Through regular use, it’s also interesting to see how the addition of one other person in a room will elevate CO2. We also used a combination of turning on a ceiling fan and opening a window, and also using an air purify to see how quickly the sensors would pick up on the change. Though the volatile and particulate mater feedback was relatively quick to change, carbon dioxide was a bit more delayed. Regardless of Foobot’s accuracy, through our rudimentary tests we were able to identify when humidity was too high and when air needed to be circulated throughout the room. As a result, Foobot would then be able to talk to other devices and tell them to react and adjust the current air quality. This leads into the three primary integration types, IFTTT (IF), Nest, and Amazon Echo. Where Foobot really shines is its integrations, as it allows the data being collected to be turned into actions. That is assuming you have a smarthome or IoT devices, which are inescapable into the future anyways. With Amazon Echo there are several voice commands, most of which audibly detail the current air quality, followed by tips to improve it. With Nest, Foobot can tell it to adjust the temperature and act as a sensor away from the primary thermostat unit. Finally, with IFTTT or IF, you can collect data in a Google Sheet, trigger lights to go off when air quality is poor, trigger air purifiers or humidifiers to kick on, and a wide variety of other interactions. The only negative issues we found with Foobot’s functionality is that the only interface you really have is with the mobile app. Currently there does not appear to be a web app or way to access your data besides the app, which also posed a strange issue. One of the most basic components of having to create an account is to inevitably reset your password. It’s a standard feature, but from what we found it looks like you have to email their support to do so. 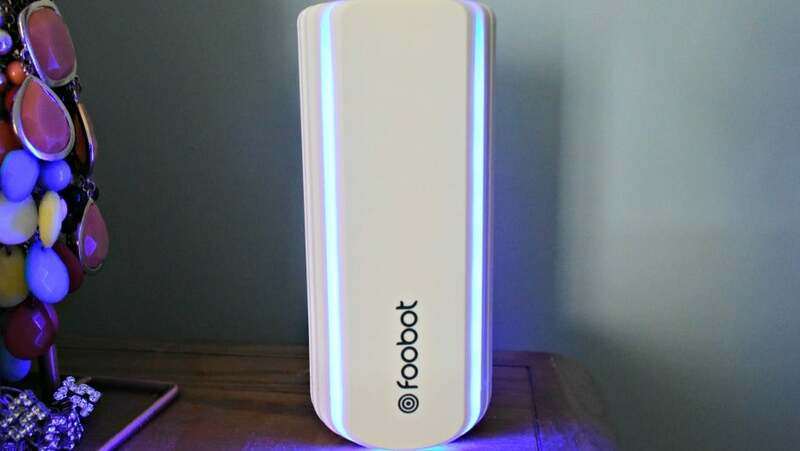 Overall the Footbot has a lot of usefulness to those who have or are planning on having a connected smarthome. WIthout the connected devices, Foobot still collects data, but relies more on people to make the necessary adjustments on their own. Foobot is not necessarily the prettiest device, and it won’t exactly fit in with your home decor. Coming in at just under 7 inches, the white plastic body is met with ridges, and highlighted with notification LEDs. When it’s darker and you mostly see the LEDs, then it’s a bit easier to get past the weird body of the gadget. 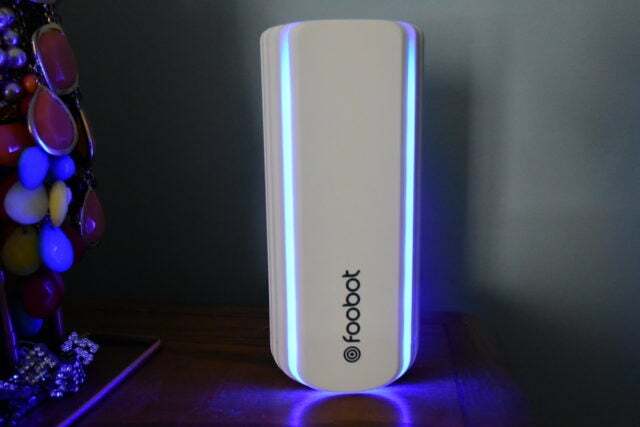 When Foobot is blue, your air quality is ideal. When it’s red-orange, there is something wrong and it likely sent you a notification. Within the app you can also control the brightness of the LED and more recently schedule when it is on or off. It does doubleup well as a night light. The hardware itself doesn’t have any interface built-in beyond the knock knock feature, and everything is controlled through the app or based on events occurring. As far as the app goes, it’s also relatively easy to navigate and understand. However, you do need to get a good grasp of what some of the readings mean, which the onboarding emails should help. For example there is a tab for Particulate Matter, you press it, and it gives you a reading and tells you what range your room should be in. Foobot sensors track PM2.5 or fine inhalable particles, with diameters that are generally 2.5 micrometers and smaller (more from the EPA here). In layman terms, this tracks dust, dirt, soot, smoke and other very small particles that we breathe in. As we breathe in this fun stuff, we increase our chances of illness. Foobot does dig into the high-level education, but for this to become actionable you also need to know how to circulate the air or trigger other devices to reduce the count. The same goes for Volatile compounds (VOC), and the algorithm based results for carbon dioxide count. Though this is not a factor in the review, props to whoever designed their packaging and branding. Both of these gave the device a lot of personality that flowed throughout unboxing and into regular use. Overall the messaging, personality, and simplicity made what I’d believe to be a relatively boring gadget into something both educational and dare I say cute. Should you buy the Foobot? Simply put, yes. If you care about the quality of air you breathe, have issues sleeping and have no idea why, are concerned about mold growing, or want to really add some brains to your smart home, this will do the trick. It’s not exactly the cheapest household gadget/sensor on the market, but in comparison to both the Canary (does not track as much) and Awair it lines up well. Overall we give Foobot a 4 out of 5 due to its ability to add real data to your smarthome, rather than just timers and assumptions. It’s not necessarily the prettiest gadget, but Foobot’s sensors truly do allow us to see the unseeable. Plenty of wearables have launched at CES this year, including new smartwatches from Withings and Garmin. We also saw a bodyheat-powered smartwatch and a hearing aid with fall detection and in-ear language translation. 2019 has finally arrived, and it could be the perfect year to make a new start and improve yourself. As luck would have it, tech can help, and we've listed some of the must-have gadgets to help you be the best "you" possible.